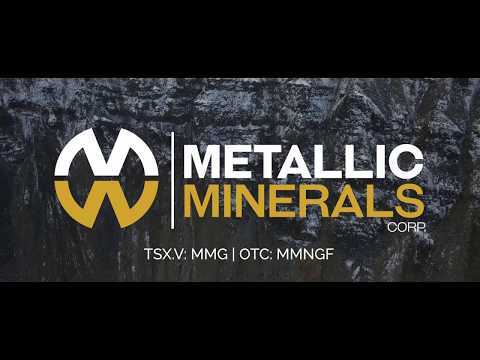 Metallic Minerals Corp. (TSX-V: MMG / US OTC: MMNGF) is a growth stage exploration company focused on the acquisition and development of high-grade silver and gold in the Yukon within underexplored districts proven to produce top-tier assets. Our objective is to create value through a disciplined, systematic approach to exploration, reducing investment risk and maximizing probability of long-term success. The Keno Silver Project is located in the historic Keno Hill Silver District of Canada's Yukon Territory, a region which has produced over 200 million ounces of silver and currently hosts one of the world’s highest-grade silver resources. The Company’s McKay Hill project northeast of Keno Hill is a high-grade historic silver-gold producer. Metallic Minerals is also building a portfolio of gold royalties in the historic Klondike Gold District. Metallic Minerals is led by a team with a track record of discovery and exploration success, including large scale development, permitting and project financing.